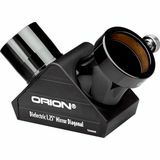 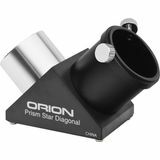 The 1.25" dielectric mirror star diagonal angles the eyepiece to a comfortable viewing position, while dielectric coatings give you brighter images compared to a standard star diagonal. 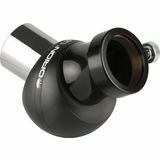 The harder surface from the coatings also makes cleaning easier. 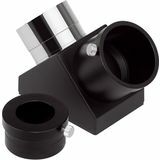 This high-end diagonal features 99% reflectivity and a twist-tight clamping mechanism to securely grasp inserted 1.25" accessories with a simple clockwise twist of its red aluminum collar. 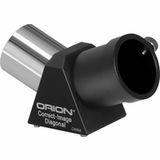 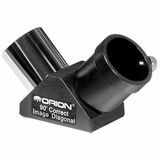 With its twist-tight clamping mechanism, the Orion 2" Dielectric Twist-Tight Mirror Star Diagonal presents a significant upgrade from typical thumbscrew-equipped diagonals. 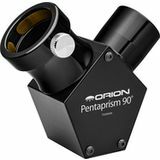 Boasting 99% reflectivity, this is the perfect diagonal for peak performance. 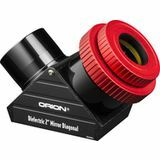 The 2" Orion Dielectric Mirror Star Diagonal boasts 99% reflectivity giving you very bright images. 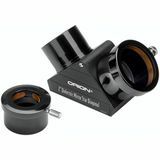 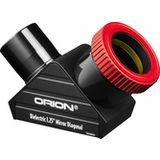 It is very durable and includes a 2"-1.25" adapter so you can use all your 1.25" and 2" eyepieces.